N2 is the main antagonist of NieR: Automata. "Official name: "Terminal". A program projected by the network server of the machine lifeforms. The self-evolution program installed by the Pods eventually fractured its ego, causing the various aspects of its personality to turn on each other." Seen during route B at the alien mothership after Adam and Eve are defeated. On the Bunker at the end of route B when 9S enters the flight unit to save 2B. Appears at the end of Route B, during 9S' "death" at the hands of 2B. Makies multiple subsiquent appearances during route C.
Represents the artificial intelligence also known as the Tower System Services. 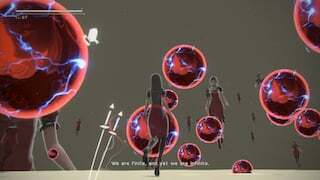 The Red Girl will multiply as the encounter continues, attempting to overrun the player with sheer numbers. While these units can be killed using normal methods, the only way to destroy them permanently is to allow the Pods to 'fracture its ego'. This is done by not killing the programs and simply waiting. 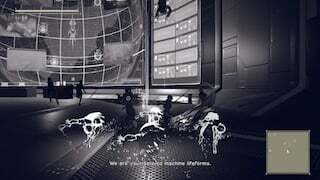 The only attacks this unit uses are slow energy projectiles however these quickly become a problem once the program starts to multiply itself. The designation "N2" most probably straight up means "Nier 2", given how Nier is mentioned in the report on Red Girls. Machines were inspired by the long deceased Nier to create their own version. 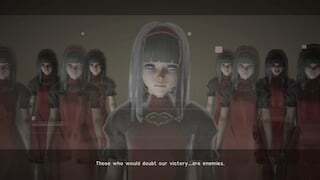 Just think of it, there were two Niers, one (the body of Nier) set on destroying humanity (unbeknownst to him) and the other (the soul of Nier) set on saving it (causing it&apos;s doom in the process) and then the two N2s turn on each other, one wanting to destroy A2 and the other wanting to save her. POD IS BADASS! outsmarted every "AI" in the game. Shout out to the G-Man from Half Life/Half Life 2? 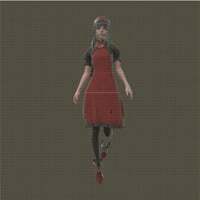 so this is one of the best theories concerning the red girl which would shower her true importance to the story and project yorha and includes the reason why she was in those 2 locations in the 9s route. They were in the background of 9S Route B leaving Bunkers Hanger and after killing Eve saw 2 of them. I want to know every single locations we can see her/them on. I mean, I have seen her on two locations in the background while I was talking to a NPC or interacting with something. I do NOT remember where I saw her the first time but the second was inside the bunker. Anyone knows more locations and the story why she is there? A possible shout-out to the route A final boss from Drakengard. If I was a machine life-form, I&apos;d want to be a little girl too.